The two tournaments going on this week, one in Thailand and the other in Kuala Lumpur (which HCFoo has been covering religiously!) feature pretty strong fields, and I just noticed something interesting—at least to me, tennis dork that I am: Between the two, none of the top six players are competing. Usually, I'm all like, "The big guns should be out there," but with each event having a couple of top 10 players apiece—for ATP 250 tournaments, no less—I really can't complain. The seventh- through 13th-ranked players are out there getting at it, which is good to see. 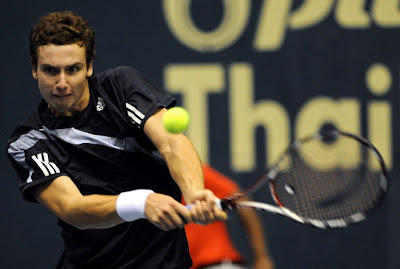 • Jo-Wilfried Tsonga vs. Ernests Gulbis: Jo-Willy should be OK here, but Gulbis is ultra-talented. I think Tsonga will get him, though. • Andreas Beck vs. Donald Young: I can't tell you how happy I am to even see Young in a foreign country playing! He got into the main draw as a lucky loser after Sam Querrey's freak accident, but he could win this match. Beck blasts the ball, so it'll be good to see if he can handle that type of heat. I'm going with Young here. • Joachim Johansson vs. Richard Gasquet: You know, once upon a time, if you said these two would be playing for Slams, you wouldn't have been thought of as crazy. Glad to see Johansson back, but I think Gasquet might be in too good of form for him. 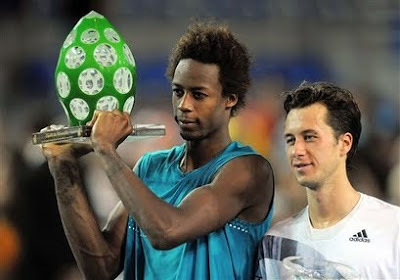 • Martin Damm/Robert Lindstedt vs. Marcelo Melo/Andre Sa: What's this? A doubles mention on TTA?? I know, I should mention dubs more—I'm starting now! Damm has been out there a looonng time, but he's still playing at a high level, and his partner Lindstedt—a past U.S. Open champ—is solid. Melo and Sa have been one of the best the past few years, but I think the veterans will take them out. "I don't know about the other players, but I feel like I didn't have enough time to recover after the U.S. Open. It's hard to get ready for such a big event like this and I just wish we had more time." — Elena Dementieva, after falling in the second round of this week's Pan Pacific Open. Dementieva, if you recall, lost in the second round at the Open to Melanie Oudin. If you've been following the results of this Tier I event featuring nine of the world's top 10 players, then you also know that only two of those players have made it to the third round. What's the story here? Is the whole top 10 in a slump? Has the depth on the tour improved that much? Now, I'm all for an early-round upset or two, but this has been a little too much. Personally, I don't think that argument by Dementieva holds any weight as the Open ended weeks ago—and especially early for her! A spin can be put on what's happening in Tokyo, but I would assume the WTA powers that be and tournament organizers can't be too happy about this. There's already all kinds of controversy with the rankings going on (number-one Dinara Safina was also an early Tokyo victim). And I think after what has happened here this week, there will probably be more questions—and deservedly so. Is there really a need for a longer offseason? Should there be fewer events? I guess this is all for the WTA to examine because you can't have your star players going out like that at any tournament, much less a showcase event. When I was scouring the ATP and WTA sites at the beginning of it, two tournaments really intrigued me: the ATP stop in France and the WTA event in Korea. Despite the lack of top tenners in either draw, I thought they both had interesting potential, particularly in regard to the top seeds. In Korea, the top seed was Daniela Hantuchova, the former world number four, who's been a model of inconsistency for years now. I thought she could add to her mantelpiece with a win here, but one of the most impressive comeback tennis players ever, Kimiko Date Krumm, had other ideas! Krumm took Hantuchova out in the quarters, then beat Maria Kirilenko in the semis and Annabel Medina Garrigues in the final. Not bad for a woman turning 39 and away from the tour for more than a decade! I don't know how much she plans on playing, but I think Krumm can give these players today fits because she hits the ball so flat. It may not be a Slam that she won, but I'm sure it's just as important to her! I FINALLY got to use that!!! I'm a little confused on my New York to Europe time differential, but we're supposed to be mere hours away from Justine Henin announcing her comeback to the WTA tour. I got the scoop from reading the Twitter updates of GoToTennis, HCFoo's Tennis Blog and On the Baseline. And Down the Line! has a couple of late-breaking updates. Now that I've done the promotional thing for some of my favorite blogs and Web sites, I'd like to direct you to an old TTA? post that saw this coming. And where the "Belgian waffling?" phrase was first coined! Just click here. First, I'd like to apologize for not posting something about the whole Serena Williams foot-fault debacle, which only happened eons ago, any sooner. • We all know it wasn't a foot fault. • If a foot fault was called, though, it's best to move on rather than blow up, but I don't think you can blame Serena for losing her cool. It was a tense situation, but she's enough of a champion to know that you have to put that behind you and focus. You come at a judge like that, you're going to be penalized, which is the right thing. • Personally, I don't even think you call foot faults at that point in a match if you haven't been calling them already. I know that rules are rules, but I prefer to follow the "let the players play" creed that basketball uses in the final minute and a half or so of games. • I really, really had a problem with Patrick McEnroe at the doubles trophy presentation. She said what she had to say. Who is he to badger someone like that? He's not a journalist because if he was, he wouldn't even be at the U.S. Open calling matches seeing as how he works for the USTA and all; it's a conflict of interest. • I had a problem with ESPN's phone interview with P-Mac the next day and how they showed a clip of him asking Serena for the apology, but they only showed him asking the final time before Venus answered. Then he said there's no comparison between Serena and Roger Federer's cursing because he's "all-class" or a "class act" or something to that effect. If Serena has no class, then what would he say about his brother? That's it. Venus, I'm moving on! A Dent in the rankings? It's funny that we're less than a week removed from that extra final day of the U.S. Open and the tours have definitely moved on, with no time for anyone to catch their breath, much less harried bloggers! The guys wrapped up the Davis Cup semis with Spain and the Czech Republic making the finals. And the WTA Tour say tournaments won by Shahar Peer and Melinda Czink. But lurking below the glitz and glamour of the main tour stops are the lower-rung events: For the guys, it's the Challenger circuit. And one result really stood out to me—that being Taylor Dent winning in Tulsa, Okla., without dropping a set over the week! It's so wild to think that he had pretty much moved on with his life after being forced out of the game with a back injury, only to start making a comeback this year. He's had really good results this year considering where he's coming from. If the back holds up, he can definitely make a complete comeback. And it's great to see another serve-and-volleyer on tour: if anything, just to witness a different playing style. So hats off to Dent, and I hope the comeback continues! In all my years of Slam watching, I don't think I've seen as much drama and surprises and what-have-you packed into a two-week span as what we saw at this year's U.S. Open. I know it's too much to ask, but if this particular Open didn't elevate pro tennis more into the mainstream then I don't think anything will. Look at today's match: Everybody figures Roger Federer's going to win going away. However a 6'6" kid from Argentina had other ideas about that and only stopped one of the greatest players of all time from winning his 16th Major! Congratulations, Juan Martin del Potro! Very well-played. I mean, every day there was something big happening that was leaping off sports pages across the country, which was great to see: I imagine from the casual fan's perspective, too. It was an amazing fortnight (am I only allowed to say "fortnight" during Wimbledon?) and one I think will be pretty hard to top! If you would've asked me two weeks ago if I thought Kim Clijsters would end up a two-time U.S. Open champion, I would have said that's as likely as a foot fault being called on a player deep in a second set and that player losing the match after being docked a point for verbally abusing an official. I mean, it just couldn't happen, right? Oh, wait: that did happen! So I guess it's within the realm of possibility that Clijsters could win after all! • Kim Clijsters would be in the semis? • Melanie Oudin would be playing in the quarters? • No U.S. male would make the quarterfinals for the first time EVER? • Andy Murray would lose so early, seeing as how it seemed he was destined to get to the finals? • Roger Federer would almost be under the radar with all the other stuff surrounding the fields on both sides? • Rafa Nadal would be in shape to make a quarterfinal run? And possibly go further? • Novak Djokovic would reclaim some love from the fans? • That besides Clijsters and Oudin, Ni La and Yanina Wickmayer would make it to the quarters and Dinara Safina or Venus Williams wouldn't? 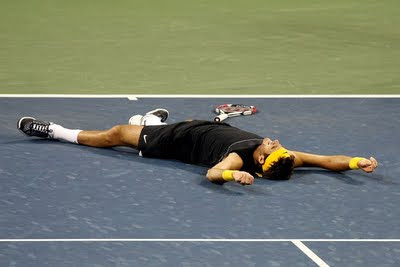 • That Andy Roddick would fall so early considering how great his year had been? • That both the men and women's tournaments are guaranteed to have a first-time U.S. Open finalist? If you said yes to any or all of these things, let's start calling you Nostradamus! I sure didn't see this coming! What do you think, folks? Can she do it? Kim Clijsters is in the quarterfinals at the Open after her three-set win over Venus Williams today. Next up for her is Na Li, which is as good a bet as one could make for her to possibly come through. That puts her in the semifinals, and the way this tournament has gone, if you make it that far, anything's possible as far as winning goes! There's all kinds of documentation out there on the Googles detailing my concerns about Clijsters' comeback, mainly talking about how I thought she should just stay away from the game if the family life is what she wanted. But now I'll say that if she were to win, I wouldn't be mad at her! John Isner: Wow! Melanie Oudin: WOW! 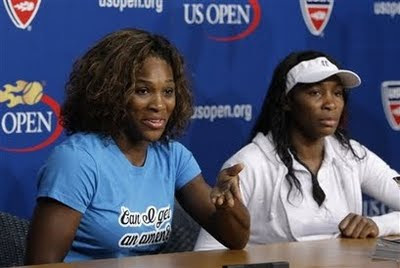 Those were some performances by a couple of young Americans out on Arthur Ashe yesterday, huh? I have to tell you, I do have mixed feelings about their wins, seeing as how they both took out a couple of my personal favorites, Andy Roddick and Maria Sharapova, which leaves me kind of down. But as a fan of U.S. tennis, you can't help but be excited about their wins, too! I mean, Oudin is hands down the real deal and when was the last time that could be said about an American woman player? When Serena Williams had her first wins over top players back in 1998? Oudin's draw is so wide open now, it's ridiculous. I don't know if she can keep it going, but it sure is fun to watch! As for Isner and his prospects here, I like how he's saying in no way is he satisfied, and is looking forward to the prospects of doing some more damage. If he can hold his nerve like he did yesterday in a fifth-set tiebreak against a top-five veteran, who knows what could happen? 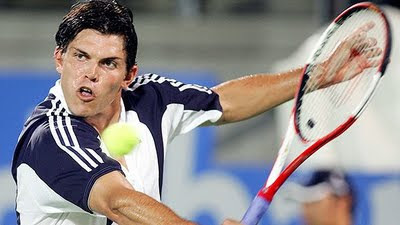 His next match against Fernando Verdasco will be a tough one, but he's got a really good shot against the Spaniard. Anyway, week two at the Open is kicking off, and who would've thunk Isner and Oudin would still be standing tall (and short!)? So, this has been some first week so far at the Open, huh? Among all the different storylines and results, to me there are a few that just really stood out. And me being the sharing type, I'll let you in on them! • Agony in defeat: Man, my heart really goes out to the Serbian sledgehammers, Jelena Jankovic and Ana Ivanovic. Jankovic played today's match with a heavy heart as her grandmother just died last night. Talk about rough circumstances to compete in! 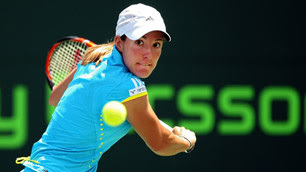 But I don't want to take away from Yaroslava Shvedova, who was playing high-quality tennis. Still, Jankovic had multiple chances to possibly win but didn't come through. Tough loss. Then there's Ivanovic: I don't know what's going on there. I do know it's a sad sight to see. During her match, I was flipping back and forth to "Andre Agassi: Between the Lines" on The Tennis Channel. After her loss, I thought of what I had just watched in the show, the legendary story of Agassi going back and playing those Challengers at the end of 1997 to gain confidence. I'm not saying she should hit the ITF circuit, but there has to be some smaller tournaments she could play in and work on her game. • Could he care any less? : Marat Safin, playing the last Major of his career, lost in the first round to Jurgen Melzer. Now, I actually gave up on Safin last year just because of his disregard for the game and his place in it. And in a way, I think he disses his fans by not putting forth more of an effort. Would it have killed him to maybe stick around the court for a second or two to soak in the applause the New York fans gave him? And I know this may sound harsh, but I hope he just decides to go ahead and call it a day. What's the fun in watching a supreme talent lose to journeymen? He doesn't care, so why should I? • Sweet 17: What can you say about Melanie Oudin that hasn't been already? Wow! To knock off Elena Dementieva like she did was impressive. I can't remember the last time a young American came out with these types of results she's had the past few months. Like I said, there's been tons of other things going on, these just caught my eye the most. I'm sure there'll be plenty more tales in the days ahead! It's me Tweeting from the U.S. Open! I'm heading out to the main event to catch the action on Friday. And while I'm out there, I figured, "Why not do some Twittering?" So that's what I'm going to do! If you haven't signed up to follow TTA? on Twitter, please do so and follow me on my day around the grounds of the National Tennis Center!